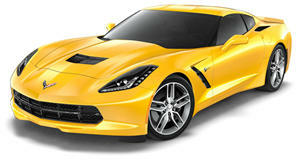 The C7 Chevrolet Corvette Z06 is an amazing machine, but some people might not be able to afford the $80,000 price tag. While there are plenty of affordable cars with superchargers that can be purchased on the used market, they aren't quite as fast as the monstrous Z06. Callaway offers a C7 Corvette with a supercharger which produces 610 hp. It can hit 0-60 mph in 3.4 seconds and do the quarter-mile in 11 seconds. The Callaway is pretty fast, but it doesn't come close to this impressive procharged C7 with over 1,000 hp. The car packs a supercharger kit which bumps power to over 1,000 horses, but the engine internals have been left alone and the transmission and differential are completely stock. It also has the seven-speed manual rather than the faster eight-speed automatic which makes its quarter-mile times even more impressive. The car was fitted with drag radials when it completed the quarter-mile in just 9.69 seconds at 143 mph, making it one of the fastest Corvettes we've ever seen. A Nissan GT-R may be able to lay down a faster time, but AWD and a dual-clutch transmission make it much easier to drive than the Corvette. We look forward to the upcoming ZR-1 Corvette, but we doubt that it will be faster than this drag racing beast.